Employees at the Bank of England proudly announced that the new £10 note will be designed with raised dots to help the UK's visually impaired. This is yet another victory for the Royal National Institute of Blind People (RNIB). The RNIB has been working closely with the Bank of England over the years to make banknotes more accessible to the UK's visually impaired community. In addition to adding raised dots to the £10, the RNIB encouraged the Bank of England to add many features UK residents now take for granted on their pounds. A few of these innovations include bold numbers, vivid colors, and tiered sizing. The Bank of England announced the new £10 will have raised dots in the top left corner. This is the first time a pound note has a tactile feature. Members of the RNIB believe these bills will make a huge difference in the lives of the UK's visually impaired residents. Scott Lynch, the RNIB's director of solutions, said raised dots make it extremely easy for the blind to handle their money with confidence. Lynch told reporters, "In our testing with blind and partially sighted people, these markings enabled correct identification of the note's value." 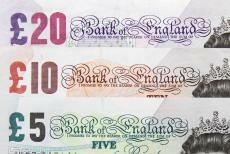 Now that the £10 is set, the RNIB is working on ways to improve the new £20. Lynch said the RNIB is working with the Bank of England to add tactile features to the future iteration of the £20. As many people already know, the new £10 will be issued on September 14th. The new notes will feature 19th century author Jane Austen on the back. Austen is perhaps best known for her classic novel Pride & Prejudice. All of the current £10 notes, which feature a portrait of evolutionary biologist Charles Darwin, will be withdrawn in the spring of 2018. Current estimates suggest that around 2 million people in the UK are living with some degree of sight loss. Of those 2 million, 360,000 are either legally blind or visually impaired. By the way, the new £20 note will be launched in 2020. This polymer £20 note will feature a portrait of Romantic artist J. M. W. Turner on the back. Today, the £20 has an illustration of influential Scottish economist Adam Smith. The RNIB is a registered charity in the UK with offices in Northern Ireland, England, Scotland, and Wales. This group's head office is located on 105 Judd Street, London WC1H 9NE.